Do you work for Microsoft Teams? Microsoft Teams is a chat-based workspace in Office 365. It brings together people, conversations and content along with the tools that teams need so they can easily collaborate to achieve more. Microsoft Corporation develops, licenses, and supports software products and services; and designs and sells hardware worldwide. Flagship products include Windows, Office, Azure, SQL Server, Exchange, SharePoint, Dynamics ERP and CRM, as well as Xbox; Skype; and Windows Phone. "It's so much easier to discuss important matters"
"The amazing software for internal communications!" I like this program very much because it provides several possibilities of use, private conversation, group conversation, audio / video conference, sending of any type of file and also it runs in weaker machines. I also like it to be synchronized with other windows applications. Until the present moment of use, I have not yet found any negative points in this program. It appears to be 100% stable with no bugs. I recommend using this program because it is light, easy to understand and use. It also runs on old machines and process machines. It is easy to leave a message or locate any person in the company in any country. It is also synchronized with the outlook calendar, where it is much more practical. "My new favorite collaboration platform"
My favorite thing about Microsoft teams is that it combines many collaboration features into one platform. You have wikis, apps that you can integrate e.g Skype, Trello, file shares, chat system, meeting (conferencing) functionality, call functionality. I like the fact that you can create teams for various projects and share resources seamlessly. I also like the fact that it gives you the option to view files in SharePoint and link with your communities of practice there. The chat feature is on steroids and I just love it. I've just been trying out Trello and while you chat you can click on the Trello icon to quickly reference any project that you might have on Trello. There are many features that I'm still messing around with. In addition to that you can also click on the ellipsis which give you more options like Youtube search, Wiki search, Weather, Stocks, bing news etc! How about that for convenience. I love this integration because it means I get to concentrate only on my Microsoft Teams Window and not have to switch between several windows to get the information i want as it is all integrated within the platform. You can can add or remove team members seamlessly to any project that you might be collaborating on. I like the fact that Its just a rich full featured application that can still extensible by integrating third party apps (my favourite being the Trello integration). The tiles on the left side and tabs within the UI are quite intuitive and try as much as possible to make maximum use of screen real estate to give you the most in a single view. I also just love the modern looking UI with its line and minimalist icons and color combinations are crisp and gentle on the eye. There's also a little neat feature that many overlook and that is the ability to go back / forward just as you would in a browser or on a mobile app. This is awesome because Ms Teams has lots of windows and tabs and you might get lost while navigation so this feature is great for retracing you steps. The myriad of features can be overwhelming for new users before you map out where your apps, menus and modules are. This can be a put off for some users. The other thing I may have experienced was that if you are where there is low connectivity some functions may fail but hey, which connection oriented app doesn't fail with poor connectivity? Better project Management, remote meetings and conference calls, mobility and collaboration. "Microsoft Teams for work group interactions"
I really like how teams is available through multiple platforms. The mobile version is very easy to use, as well as the desktop option. The notifications work well and I can easily see which group I am receiving a message from. I like how it interacts with other Microsoft 365 products and that it allows files to be sent quickly and easily through the chat function. I can quickly and easily view my Microsoft office calendar and set my status as needed (i.e., away, busy, etc.). Overall, Teams has been easy to use for team communication and I look forward to learning more about all of the functionality it can provide as I continue to use it. There were a few issues with notifications initially, however, it seems that everything is working now. There is a bit of a learning curve at first with regard to finding where messages are stored or coming from because the way you engage in group chats is similar to how group chats are set up when texting. If someone is not included in the group chat, it will be a separate conversation window, so you have to be careful to make sure you are keeping up with the right chat among the specific group of colleagues. I think it is a great solution for team interactions. I am not sure that it would have the same impact that it does if we did not use all of the Microsoft 365 products together, but it works for my team. It is much easier and quicker to interact with colleagues through Teams, rather than sending an email, when you need an immediate response or have a quick question. Our team gets a lot of emails and a question from a colleague can get lost in our inboxes, so when we need to get a hold of each other quickly, we use Teams to communicate. "Everything you need in one place"
The great thing about teams is that you have access to individual chats, chat rooms, and meetings all in a single place. You can still access these things in the middle of meetings. Another awesome feature is being able to add tabs at the top of the chat rooms to facilitate Wiki articles, Microsoft 365 documents, and uploaded files. Activity Alerts are very useful as well, and I use it often to navigate exactly where I have been mentioned or where someone has added to the conversation. I think the UI is a little blocky and could look more seamless, but other than that there's not a lot I haven't liked. One feature I wish worked: when I click on an image in chat and a preview appears, clicking "copy" and then "paste" (somewhere else) doesn't work. The navigation seems confusing at first, but it's because there are so many great features available. It's easy when you've used it for a few days. It brings everything we need together. We came from Slack but the meeting features didn't meet our needs. "Microsoft Teams - More than just a basic communication tool"
Being in constant communication with the people you work with is a very important aspect of a group. Microsoft Teams provide that basic but important need to our team. 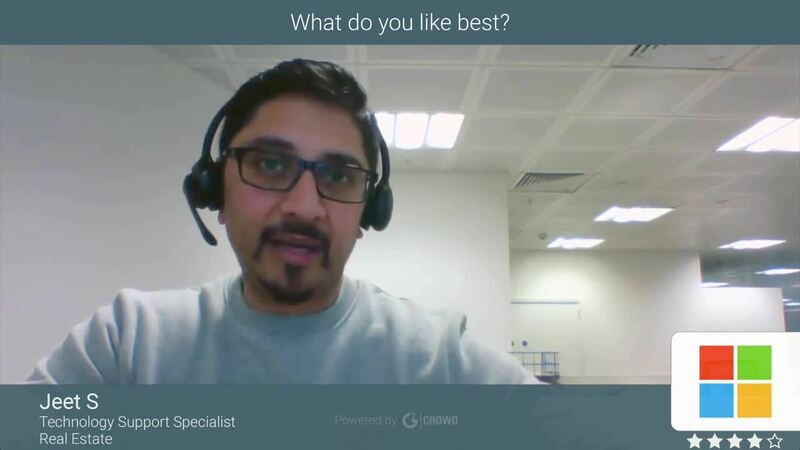 As a consultant with limited access to some of the tools, Microsoft Teams helped me a lot to connect with the people I work with. With Microsoft Teams capability of sending messages, images, and files, we don't have to ask someone to send emails with attachments anymore. Moving forward all we need to do is to private message someone or in a group conversation to send a particular file. Files are being received real-time and we don't have to check our emails from time-to-time to see if we already received the message. Microsoft Teams also incorporates itself with Microsoft OneDrive for Business. Any files that were sent on the group is automatically stored on the OneDrive for Business which makes it easy for us to track and get back on the previous files that were sent. Microsoft Teams can also give you an option to customize your messages with your own font style and color making it your very own. The only thing that I dislike about Microsoft teams is that sometimes the notification bar or pop-up doesn't work when you receive a message from someone. As a workaround, I usually place Microsoft Teams on my other monitor to make sure that I will always be able to see any new messages. I would certainly recommend Microsoft Teams to any company since anyone with Microsoft Office 365 for Business access can use it unlike Skype for Business. As a consultant with limited access to some of the tools, Microsoft Teams, helped me to communicate with anyone on my team and anyone on our company since everyone has access to it. "A good improvement over Skype for Business"
Teams is more friendly, goes beyond a simple messaging tool, allowing group creation that persists all messages to the cloud, like a discussion forum. This helps a lot a team to be organised. The 'chat' window can be customised by adding some add-ins. One in particular I love is the 'Freehand by InVision', that works like an interactive drawing board. Another cool stuff is the GIF icon that searches all kind of GIFs to be sent to your peers! The only thing I really dislike is regarding notifications. I can set up to receive banner notifications, but it's not like Skype for Business which sends only the first notification and then stops and blinks the icon only in the task bar. Banner for all messages is really bad when you don't want other people around to see a preview of all messages that are being sent to you. No option to blink icon only. Excellent replacement for Skype for Business. Only a small defect mentioned above. Teams is helping to share content with team members and is centralising the information discussed in one place. I'd dare to tell it replaces email and simplifies the communication process, specially for project discussions. "A great platform to talk about issues and where share information as public or private way." I usually use Teams as social gadget on my work or to keep important information about some projects. This platform lets you to create different groups, to talk about and to share documents, videos and other kind of materials as a private or public way. Finally, the most thing that I like is the possibility to keep save and share all kind of information as public or private way. I don't find anything dislike to me. I work with Teams since 3 years more or less and always It has work well. I recommend because the security, the useful, and the different kind of uses you can get with this platform. I don't find problems using this tool. As benefits I like that you can have the desktop app or use the tool by website. Also, it has de possibility to edit files online withouth download it. My favorite thing about Microsoft Teams is being able to upload an Office file to Teams and knowing that all of the people working on the same project are always able to view/edit the latest version. Microsoft Teams needs to work on the delivery time of the message received while being offline. On occasions I have received an email letting me know that someone within my organization contacted me through Teams, but the email has arrived a day later. Other times I have received messages through the chat and my colleagues have told me that they originally sent the message a day or two ago. The messages were typed while I was offline on Teams, but were delivered once I got online, making it seem as if a colleague just sent the message. Read the T-Bot chat which includes answers to the FAQ. Contact colleagues within the organization, look at their organizational chart, as well as work on files that require the collaboration of multiple people within the organization. "Microsoft Teams - Connecting you to the whole team"
Microsoft Teams is what keeps on my station but still on constant communication with my whole team. The best thing I like about Microsoft teams is its capability to connect me to my whole team or to any individual person that uses Microsoft Teams as well. It's not just its capability to send messages but I can also send images and table for visuals. Microsoft Teams also incorporates itself with OneDrive for Business. All images that have been sent to the conversation will automatically be saved on OneDrive for Business for archiving purposes. Microsoft Teams also have sound and pop-up notification which will make sure that every user will be notified if he or she receives a message. Notification is also present on the team conversation. Microsoft Teams can also be installed on mobile devices which will make sure that you will stay connected with your team even if you're outside work. The only thing that I dislike about Microsoft Teams is its long log-in time and set up if you're using the app version on a Windows computer. Sometimes there are also log-in issues if another person used Microsoft teams and forgot to log-out afterward. If you want to have constant communication with your team while being pre-occupied with other tasks or if you're outside work, Microsoft Teams will keep you connected to them. One of the challenges that we have before is constant communication with your team if you're pre-occupied with other tasks. Now that we have Microsoft Teams, we can now communicate with everyone while remaining seated on my station to do other tasks. "Functional but unspectacular messaging tool"
Ability to format your message for effect makes your messages more noticeable. Being able to reply to messages in a Teams (not individual) chat is also very useful to group chats and prevent fragmented conversations. Search function is difficult to use. Teams and individual chats are separated. The emoji options are limited and not as cute as other services, and the gif search results are never reasonable. Microsoft Teams gets the job done without any flashy frills or gimmicks. All of the functionalities you would need in an internal messaging tool are there, like sending messages, mentioning people, creating channels or teams, sharing files, and making calls. However, that said, there are better software available if being able to search through your log of messages effectively is crucial to your business requirements. The search function in Microsoft Teams is not easy to use. Furthermore, if you attempt to scroll too far up a certain message chain, Teams will "crash" and send you back to the most recent message. It is also a pain that teams and individual chats are in separate tabs forcing you to go back and forth. We use Microsoft Teams as our primary internal message system. It is easy to mark up text in order to emphasize or maximize the effect of your message. The channels are also a great way to crowd source information and ask questions to a broad group of users. "Users will find it easy. Admin part still lacking. " Easy to use for users but the admin part is still lacking a bit. It's easy to see that there's been put a lot of investment into this and there still is. It adds a bit extra to the ordinary communication tool such as Skype For Business and eliminate some of the needs for emails together with a lot of options for add ins. It's still hard for users to differentiate between Skype, Skype for Business and Teams but they will get there with time as Teams have many more features. The admin interface is still not quite there yet. It's easy to see that it is an ongoing process and that they're getting there soon. Make sure to make a clear plan and path about your communication tools. Train your end users in what to use when etc. We have been able to open up the organisation and be more streamlined. We have had a lot of communication tools. Now we can scale down to one together with better productiveness . The clean and easy to use user interface. Lack of customization. I know the product is still new, and maybe things will change later on, but there are features that are enabled by default that myself and other IT staff would like to disable/change but cannot. Teams is an excellent option if you're looking to quickly set up a collaborations platform for your organization. Especially if you already have Office 365. Microsoft has packaged a lot of functionality into an easy to get started with and easy to use application suite that integrates with other Microsoft products. If you have very particular needs, and more customized application may be right for you - Jira for example - but for most office work Teams is a good offering. We use to for collaboration within and between our functional teams. We are in particular using file sharing, wikis, sharing Web pages, and Planner. We'll probably use more features as time goes on. We're transitioning much of our electronic collaboration from SharePoint. Compared with SharePoint, the Teams interface is much easier for the user to interact with. Teams whittles down SharePoint functionality to the most common features which helps users access the functionality they need and prevents problems created by users using a system that's too complicated. "So close to exactly what we need"
I love that I can communicate with every team I work with in Teams, both in group chats, 1:1s, and through groups. Being able post a document in a shared location where anyone in the group can download is a great benefit, and being able to converse about it within the same application makes a huge difference. There isn't true integration with OneNote, which is disappointing. That would really round out the solution and make it possible for us to reduce the number of tools we're using. And not being able to check out a document means there's possibility for documents being edited without oversight. While I know this isn't a CMS, having that functionality for document sharing means that there is a need for oversight. If it is replacing a communication tool or SharePoint, I'd say yes, go ahead. If it's intended for collaboration, yes. If it's supposed to be a pseudo-CMS, find something else to supplement. I like that it's intuitive, sort of like using Facebook - posts, comments, and likes. It's great for being able to communicate with coworkers that you do not frequently see. It's great for being able to have a place to organize/see what projects are being worked on. There are three different ways to view Teams - online, download to your computer, and/or use the mobile app. I like being able to use the app and get notifications on the go. It's a little hard to keep up with the comments/posts. I wish there was an easier way to keep track without having to "follow" all threads manually or be mentioned. I feel like I frequently miss things. For example, I missed an important thread about keys that went missing and didn't see it until days later. I hope they find a way to make this work a little better. It's free with Microsoft Office and works well. It's a great tool to communicate with staff throughout the day and with staff you don't regularly see. It's helpful to organize files, projects, and conversations. There are a lot of features which can be overwhelming, but they're useful! Give it a try. It makes it easy for us to communicate throughout the day - not all people have crossover. I don't see the people who work in the day, so it lets me see communication in real time. It helps us organize projects more effectively and file share. "Excelente plataforma para comunicarse con tu equipo "
The chats in private groups are great, Microsoft Teams is a great business application that allows us to communicate effectively in the company without problems. Very good integration with Onedrive and Onenote, with which we can make the notes on the same platform. If you want to create a private group to add few people, this software makes it easy. It is great to add connectors from other third-party applications that complement the Teams functions. In addition, it is very useful to create notifications for meetings. It is a closed suite that does not work perfectly in other environments. The subscription payment system is somewhat arbitrary and does not offer adequate flexibility. Being a web application depends entirely on the internet connection, sometimes we had failures with the ISP and this program could not be used. If you need a complete communication system among your employees, have Teams subscriptions and it will work, however these costs can be high for users who do not take full advantage of the system. Having a suite where all the members of the team can meet to discuss the tasks of the day and manage the activities is the best use we give to Teams. Project managers can keep track of each operational element of the team with Teams. We also use all the connectors you have with Word, Excel or another Office program to prepare the necessary documents, in addition to third-party applications. "MS Teams streamlines communication and fosters collaboration"
My team has thoroughly enjoyed using MS Teams to communicate and collaborate around projects. Teams is very easy to navigate and user-friendly, making it easy to scale to new users who are not familiar with the platform. I have found that communication between different stakeholders on the projects and programs I manage has drastically increased since switching to MS Teams. There is plenty of useful features which will appeal to users who have used platforms like Slack in the past. This tool is just as useful for one on one chats as it is for sharing files as it is for having a video chat. There is little to dislike. This is an amazing tool which continues to improve as new features and functionality are added. That said, there are a few user workflows that are not always intuitive that I hope Microsoft will address in future updates. Don't delay in switching your teams communication to MS Teams. This tool will lead to more streamlined communications across organizations and project stakeholders. I enjoy being able to see my entire conversation history with an individual stakeholder or project team. On other communication tools, it was not always possible to view a conversation thread with a particular user, project team or group. "Great comprehensive tool for communication and collaboration"
What I like best about Microsoft Teams is the integration of microsoft office documents with functionality of multiple users collaborating on a document (similar to multiple users on a google doc or google spreadsheet). You can make multiple "teams" or groups if you are a part of multiple teams or projects and easily organize your communications and information in one place. You can create meetings in Microsoft Teams and have a conference style room similar to webex or Skype for Business where you can either use your microphone or call in from a phone, use webcam video, as well as sharing your screen and recording the meeting. The recorded meetings are saved to the conversation/meeting item so everything is accessible and easy to find! Not as intuitive, takes a bit of exploring, experimenting, and training to learn the best practices and ways to use this, but there are a lot of good resources and training on LinkedIn Learning as well as articles that Microsoft provides on the best way to use this tool. Microsoft Teams is a good all in one program with a good meeting program, as well as team/chat functionality and file sharing. It has everything that you can use in one place which makes it an easy one stop shop. Microsoft Teams helps our teams in different offices collaborate better as well as having a singular location for documents accessed by both teams. "It's for most people but not everyone"
For my organization, Teams came as part of Office 365. Most people avoided trying to learn about it but then we worked closely with Microsoft to deliver training sessions. Once teams started using this application they immediately started seeing the benefits when they went through training. Since it's part of the organization's Office 365 and connected to AD and Exchange server it allowed users to find anyone in the organization and send them messages. Users can also create groups and collaborate via chat instead of email. Teams groups all Office 365 applications in one place. I dislike the interface a little because it can be all over the place sometimes and font is just weird compared to Slack. There are still some bugs in the application since it's relitavely new. And i don't like that microsoft always tests with actual users new features that can be very buggy. However you can control some of that from the admin center. Keep in mind that it's not for everyone. Companies that already have skype might find it challenging to roll out Team and get users to be comfortable using it. So maybe choose one of the two only. Teams makes collaborations a lot easier for remote teams that need to work together on daily basis. Also it's helpful to share and collaborate on documents in real time. "Surprisingly Inferior given its Creator"
easy to download and invite ppl but not really a fan, to be honest. Be really mindful of all the little details you want your IM to do for you. Lesser products really provided me with a much more cohesive overall picture of details we liked. the need to reach employees in remote parts of the department. getting a speedier reply which prevents physically having to go find them or call. "Microsoft Teams Makes Communication with Coworkers Convenient"
I am a big fan of Microsoft Teams. This application allows communication within the different departments of our company. We are able to set up multiple different teams and communicate with one or all of them at once. The application allows for files to be shared and uploaded. I am able to send documents, screenshots, videos, etc. I can also complete a screen sharing session with a coworkers from the application. I enjoy being able to send pics, gifs and any other necessary file. The mobile application works well with the desktop version and ensures that I do not miss out on any messages. I also like that I do not receive mobile alerts while I am online on the desktop app. I do not like how the application handles scrolling back to review previous messages. Scrolling to review a message from a month or longer ago can be a bit of a pain. You are able to search through all messages by adding words or phrases from the conversation you are looking for. I would recommend users create and set up the different teams you will be communicating with. But the application is great for individual communication as well. We use the application for company wide and internal team communication. It allows the different departments to come together and collaborate instead of having to get everyone together in a conference call or meeting room. I like that you can do some groupal chats and are diferrent for using groups. I like the reply option, and of course, the shared file option. You can also look for people in your company, so is easy to use as a directory for the enterprise contacts. So easy and also secure, and is in your hand and one click away for the message, call, or better yet, video call your partners. Is better to manage work topics in teams, and separately the personal issues in another app. The desktop sharing option is a pretty good feature too. I cant see anything I dislike... Every person I work with is satisfied with TEAMS. Maybe the only thing is that you need to copy and save a message instead of a resend option or something like that, and that when you want to copy some message text, you can get the final letters cause of the options and like icons appear. Is worth it. Is very helpful. We use it to make video - meeting and work perfect. You can write comments or ask questions while someone is presenting. Is very useful and very easy to use. Basically, communication between the enterprise members. Honestly, I only use it to avoid using Sharepoint. My team has similar opinions as our company just outright ignores the shortfalls of Sharepoint. Control of persmissions of files through the Channel and Group system. Wannabe Slack? Slack was more fun to use but it too had it pitfalls. Team is not quite there but its not bad knowing there is something even more worst like Sharepoint. Interface is a bit convoluted, difficult to find things hidden because everything is a drop down menu. (Slack's implementation was better). Customization is rather limited, but don't know if its improved upon in the future. If your company has a sharepoint implementation then Teams is better as it runs on top of Sharepoints Database. If not, just use Slack or Skype. Substitute for Slack, out institute is a Microsoft house hence it integrates with everything Microsoft. "Better than Skype for Business"
The best part, like any good chat collaboration program is easy inclusion of files inline via pasting. I cannot stand how hard it is to do in Skype for Business, so Teams wins in that regard. I dislike the lack of integrations and ability to add to it. Slack takes the cake on the ability to integrate and create bots. If I had to choose, I would choose Slack because I enjoy the freedom of a massive integrations library, but if your company is already ingrained in mostly Microsoft business tools, then it should be a good fit. We use this to communicate among our immediate team so that we don't have to break focus / take our headphones off to talk. It's quick and easy and great to share pictures and gifs too. "Teams for office communication and collaboration with your peers"
The content sharing capabilities of Microsoft Teams is really good. You can easily share different file types like One Note File, a presentation made on PowerPoint or an Excel Sheet with your colleagues.Once can create multiple groups of different set of peers/ discipline and initiate conversation and collaborations within them securely. The product is new and good, no bad words as of now. It is a Microsoft product hence offers better integration with Office 365 applications in terms of content sharing be it a mobile phone or a laptop. Definitely worth trying the the product. Teams has excellent integration capabilities with Active Directory users and Office 365. We have completely moved our Audio-Video setup from Polycom to Teams.We are using Teams for content sharing, audio and video conferencing hence saving a lot on license and maintenance costs. "Solution that allows you to increase the quality of work teams"
This is one of the great benefits that Microsoft's teams bring us, one of them, Office 365, has many solutions, and with the creation of teams, it provides us with a tool that concentrates a large part of them and fosters collaborative work. allowing to create channels with individual chat and with email addresses for each channel, permissions management for each channel differentiating owners and collaborators, additionally each channel has the possibility of having a sharepoint site in line with the documentation management, addition of links of pages of interest to open them without having to leave the application and the possibility of integrating Microsoft or third-party solutions to channels. The adding new applications with which it can be integrated. You have your own agenda and you can schedule meetings online by skype without using the Skype tool or the mail Outlook , that is, using the same team we make the video conferences without occupying the skype line. One of the things I do not like about the new Microsoft products are the updates and they do not request permission to update and this product could not be missing, it closes to update without any warning before doing so. If what you want is to keep your workgroup organized and keep them informed of the progress of any project or keep them aligned with the objective of the company, this is your tool, it allows you to maintain the control of the grups, maintain chats and private channels, load in the sahrepoint the necessary documents to be up to date and organize or schedule meetings and conferences without leaving the application. "Social network within the company quite friendly and without loss of information"
It is a very friendly and effective way to communicate different teams within the same company. It is very similar to a social network, but in the business environment, times and the way in which certain information can be shared is much faster than in the conventional way. Computers are used to share all the instant content and to share files, and now everything comes out in teams instead of by email so that the information is not lost. It is a very good way to communicate different departments of the company, quickly and instantaneously so that all staff have access to information in a correct manner, this will reduce and shorten time and loss of information that with emails electronic was something that used to happen a lot, also the way in which all the tools of microsoft are merged is a very good option for fast communication. with this application many problems are solved because it is used basically as a social network but within the organization it is well known that in organizations we must get in touch with personnel from other areas and / or departments and this is a great way to do it , it is important to note that you can also send files that any person present in the chat room can take quickly, directly and instantaneously. "It is a solution to increase the productivity of work in teams from different areas." One of the great benefits that we saw in Microsoft teams was that office 365 has many solutions and with teams it gives us a tool that concentrates a large part of them and encourages collaborative work. making available channels with individual chat, email address for each channel, management of permissions to each channel as owners and collaborators, additional each channel has the possibility of having an online sharepoint site with the documentation management that is handled in the channel. and the possibility of integrating Microsoft or third-party solutions to the channel such as wikis, or visual studio, you had etc. the implementation is very easy but it must also be well planned to avoid mistakes. every day they have been adding new applications with which it can be integrated. You have your own agenda and you can schedule meetings online by skype without using the Skype tool, that is, using the same team we make the video conferences without occupying the skype line. It does not have an integration with Yammer, I imagine it will soon be added to the list of applications. When there is an update, there is no warning and the tool usually closes. This happens one day but after it stabilizes it works very well. the implementation if it is not well planned can end in a disaster because users can access and create integrations of applications or channels or document libraries and this way it does not end up being used, for that reason I recommend to manage well the user permissions and to plan the implementation. I recommend you make a good implementation planning and dare to use it because it solves a lot of the problems that come up with so many tools separately and with teams we solve concentrating them all in one solution. we solved to have available in a tool different channels for the internal projects that we manage and the areas without having to leave a single application. "Switch to Microsoft Teams and this is what i found"
it does not have an in-app volume slider, you need to lower the volume on the OS volume mixer when there are a larger amount of attendees on a call, it will only show 8 users and an icon you can hover over and it will show you the names of the remaining users but you can't copy or take any actions over those names, so if you need to message any of those users you will need to remember the name and type it into the search box. "collaboration and organized work using several tools in a single solution"
The use of MS Teams changed the way we work and use the solutions offered by Office 365, since from a single tool we have contracted the work team where we can measure presence and even have collaborative sites in sharepoint, share individual chats and group, organize the daily work by project channels or activities and each one independent of another with an assigned mail box and an assigned sharepoint space. the integration with almost 90% of the solutions of office 365 and to be able to have available a channel of audio chat called and video conference that we can use without collapsing the service of skype for business. The desktop and mobile application works perfectly as well as the web. Thanks to the chat channel and file sharing for each channel, we saved a lot of internal email traffic, which encouraged the collaboration of files within the same application in the teams, and each file kept its version history. It is a solution that you have to plan your output to avoid disorders, it is so complete that a bad implementation may cause the work teams do not give the right use, so you have to have a good adoption plan and manage the permissions of channels to be accepted in a good way. we worked to concentrate the work teams in a single application with all the services that apart can be accessed via web or desktop or mobile application. "Its not as easy as Skype for business"
I like that it lets you add people to groups and reply only to certain people. I am still somewhat new to this system as our company is migrating away from Skype. Hopefully as time goes on I will be able to leave a better review and state more openly and honestly what I do like about this program. I struggle when comparing it to Skype. It freezes my computer, perhaps that isn't the programming fault and a compatibility error on my own end, but it is impossible to utilize as smoothly as other communication programs. faster than using email. more direct that using email and does not have the issue in replying to all. . . . . . . . . . . . . . . . . . . . . . . . . . . . . . . . . . . . . . . . . . . . . . . . . . .
"Mix of Skype and Slack"
The best thing about Microsoft teams is that it's very responsive, you have various options of creating separate channels and teams. Chat works pretty well and if you are a part of the large organization Microsoft Teams recognizes Quick Look ID, making it easy to add all your colleagues to the channel or team. there is a limit how many people can join the chat, and it is 25, which is very low to my opinion and for my needs. This is the biggest problem that i faced using Teams, and that is why i stopped using Teams. This cap needs to be increased for big teams as mine is. If your team doesn't number more then 25 people, this software is way to go. If your team is bigger however this can be a problem, as you wont be able to invite all your team to the one conversation/chat/channel/room. My team is very big, and we have a lot of different topics to cover, my team is located all around the world, and this way of the communication through the Teams or any other IM software's is the best way to collaborate within the team. Teams is being used primarily as communication tool, ,and as file sharing tool. "Decent for team chat and communication, inferior to Skype for Business"
I like the dark mode best. Other than that I am not a big fan of the program. Nearly everything. It is clunky. The teams app for windows is a resource hog and the web interface is not much better. The teams aspect can be confusing and I often miss notifications. Sending attachments can be hit or moss and does not always work. Group chat is clunky too. We have someone who no longer works with us but his name is still on group chat because we cant figure out how to remove him. Make sure it works for your solutions and needs before making the switch . Team chat and communication. It does help us with team chats a little better that other solutions but I feel Slack or Skype for Business is better. "Good Tool for Team Internal Knowledge and Resource Sharing"
I am using both Web and Desktop Application. Sharing the documents and files on the cloud storage. Its Mobile App is also good. Never face any browser specific issue. Helpful to keep everything at one place. As it is available in all the three versions like Online Web, Desktop and Mobile applications, team member can use it from any where anytime. Chat Feature is also very helpful. Real time communication is very hard. Sometime can not open MS files online. Frequently facing slowness. Should have some more security features. Should have feature to manage automatic conflicts. Good Collaboration Tool for Team to share knowledge, chat, and to use shared resources like documents. And the main point it is available on Web, Desktop and Mobile Application. Very helpful internal team knowledge sharing, we are using it as place to keep shared documents as well. Easy to Chat on a Particular Topic. Directly share through email. Its Chat functionality is also very helpful. "Love the accessability and ease of use"
Being able to instantly contact and talk with team members, and other people in my company, many who work on different floors, or even offices enables me to quickly answer and ask questions, solve issues and vastly improves the ability to converse with friends and collegues. There isn't much to dislike my only critique would be that office online can be improved. I also think the search feature could be improved to increase user experience and ease of access of past conversations. Data analysis worked on by a team of people. Teams enables us to quickly and enjoyably remain in contact throughout the workday and outside the office via our smartphones and laptops. "Robust package but easily lost"
Microsoft Teams is a robust collaboration platform that ties into the Many Microsoft Platforms that are available. It has allowed ups to share files, calendars, OneNotes and even video files (Microsoft Stream) to put together complex project sites that meet the needs of all departments involved. Microsoft Teams ties into every Microsoft Platform it seems, and because of this you can sometimes get lost in the product. There seems to be many ways to do tasks, while this may seem like a benefit sometimes it can be a hindrance because you can quickly get lost while trying to keep on track with projects and tasks. I would start small, don't try to take advantage of every feature right away. Teams can be overwhelming so find the features that meet your needs then expand into the more robust features and add them as you feel comfortable. Team Collaboration. Project Management. Microsoft Teams has allowed our Departments to work both internally and across Departments to tackle complex projects involving many layers of the company.